Author: Rudi Paret †. Translated by: Gisela Seidensticker-Brikay †. Series edited by: Gisela Seidensticker-Brikay †, Kyari Tijani. 14 pp. Roman, 151 pp. Sayf ibn Dhi Yazan (575–597) was the son of Himyar King Dhi Yazan, who ruled one of the Yemeni kingdoms. In the sixth century, Yemen was drawn into the Persian-Byzantine conflict that had arisen over control of the trade routes between the Mediterranean and India. To aid Yemen’s independent power position, King Dhu Nawas (517–525) converted to Judaism, which resulted in religious conflicts between Christians and Jews and led to the intervention of the Aksum Empire. Consequently Aksum defeated the Himyarites in 525 and occupied Yemen. Although Aksum governor Abraha (535–560) attained independence, religious conflicts continued for fifty years. Subsequently, descendants of the Himyar lineage, the Sassanides, asked for Persian assistance and, after the death of Abraha, Sayf ibn Dhi Yazan succeeded to oust the Aksumites – with Persian support. The Persians had wanted to defeat the Romans by defeating the Abyssinians in Yemen. Hence, their support for Sayf ibn Dhi Yazan, who led the 7,500 strong Persian army along with some 800 prisoners to defeat Abyssinia. After their victory over the Abyssinians, the Persians remained in Yemen, which was then declared a Persian protectorate in a document signed by them and King Dhi Yazan. Yemen remained under direct Persian influence until the people of Yemen “heard the Islamic call”, embracing Islam as their religion. Eventually Yemenis were at the vanguard of the Islamic armies and instrumental in building the Islamic state that stretched from China to Andalusia. These historical facts are reflected in this Arabic epic, be it in reference to the Year of the Elephant (575), when Abraha employed elephants in his – failed – attempt to capture the Qa’aba, or in Sayf marrying a daughter of the Chinese king, or in reference to wars and diplomacy with Abyssinia. Conversion to Islam of defeated peoples is one of the leitmotifs threading through the entire epic. Rudi Paret (* 3 Jan 1901, † 31 Jan 1983), a scholar most renowned for one of the definitive German translations of the Qu’ran, submitted his German language version of this Nation defining epic as his PhD dissertation in 1924. As fundamental a piece of literature to the Arab world as Beowulf to the Anglophone peoples, this new translated edition aims to make available the story of Sayf ibn Dhi Yazan to a broader public. This book edition is being sold in commission by our publishing house. The copies were printed in Nigeria in 2005, have a low printing quality and may exhibit transport and storage damages. Folk epics of Muslim nations deserve a dominant position within the history of Islamic folk literature. [...] Linguistically they contain remarkable material regarding post-classical language usage, especially in the context of its development of language and demotic dialect of the last centuries. [...] Generally speaking, equally important for the history of culture and religion of Islam is the rich material presented here. These epics are true treasure-troves for folk life and folk creed, for the spiritual frame of mind and the spiritual world of a people. [...] These folk epics represent a special type of form and style that is characteristic for all of them, independent of which type they belong to: a mixture of prose and poetics. 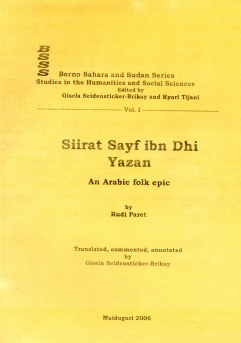 [...] The “siira” of “Saif ibn Dhi Yazan”, presented by Rudi Paret, belongs to this type of literature as it falls into the line of form and style, context, and contents of the other epics mentioned above. [...] R. Paret has studied expertly the “siira” of Saif al-Yazan and with great conscientiousness. Thus the book, which treats this subject for the first time in a detailed manner, presents a basis from which further studies can be embarked upon later and it is desirable that the other folk epics will be studied more closely as well. O. Spies in Revue International d’Ethnologie et de Linguistique ANTHROPOS, 1925, pp.